Teddy bears aren´t the only residents of Paradise Jungle. There´s also the lion, king of all the beasts. This Classic Steiff piece looks like something out of the past. His felt covering hearkens back to an earlier era at the company, when felt animals were commonplace. He has a tipped mohair mane and tail along with a black embroidered muzzle and paw pads. Our lion has airbrushed details on the orange embroidered nose, eyes, bottom lip, face, and body. His head is jointed and his legs are wired so he can stand. 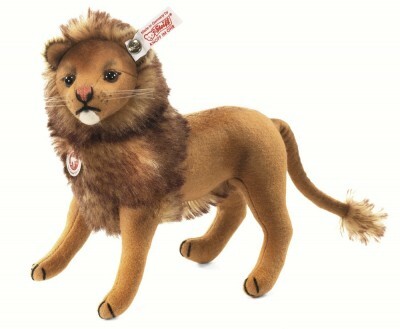 No collection is complete without the king of Paradise Jungle, our gorgeous, nostalgic Leo lion.